Here at Cambria College, your success is our goal. We work hard to ensure that each student's educational experience is tailored to his or her specific learning needs. Our team of dedicated staff and instructors are passionate about helping every student reach their goals both in education and in life. Recent Alumni, Sarah is one of our very favourite students. Sarah’s most recent experience in Dementia care has provided her with the wonderful opportunity to care for the elderly with this condition. Sarah loves being in the moment and living it to the fullest with her patients. 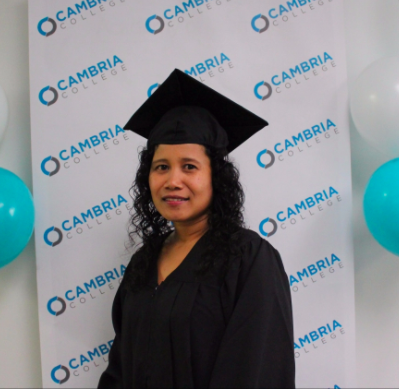 Honours student and recent HCA graduate, Helia heard about Cambria College through a friend. Our convenient Downtown location made it easy for her to get to and from school. During her practicum, a resident insisted he write her a reference letter just to show how kind and needed she was. Recent graduate and honour student, Lennie was recently awarded a position a the Clements Centre Society in Cowichan Bay. The important aim of their program is to give the residents the best quality of life possible. Lennie's role includes cooking, cleaning, doing laundry, driving residents to activities and doctors appointments, and assisting to administer medication.